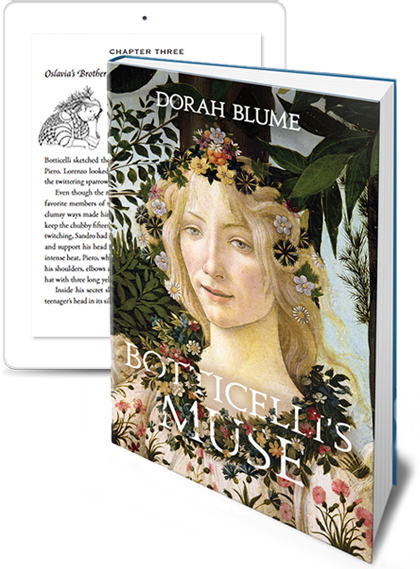 Botticelli's Muse is a provocative historical fiction novel about Italian Renaissance artist Sandro Botticelli, the conflicts of Medici Florence, and the woman at the heart of his paintings. In 1477, Italian Renaissance artist Sandro Botticelli never thought his life was going to be easy after being fired by his prestigious patron and friend Lorenzo de’ Medici. The artistic freedom he is granted by an annoying new patron half his age, only increases the artist’s paralysis and depression. Sandro’s creative well runs dry until the day he sees Floriana, a Jewish weaver imprisoned in his sister’s convent. But obstacles threaten to keep his unlikely muse out of reach. So begins a tale of one of the art world’s most beloved paintings, The Primavera, as Sandro, a confirmed bachelor, and Floriana, a headstrong artist in her own right, enter into the most turbulent of relationships. Botticelli’s Muse is the first of a three-volume series that begins in 1477 and culminates with the execution of Girolamo Savonarola in 1498. Book one spans 1477 to 1478, the time it took Botticelli to paint his masterpiece, The Primavera, which is currently housed in the Uffizi Museum in Florence, Italy. When I consider how long it has taken me to publish this story—over twenty years since a mysterious voice began to speak to me inside my journals—it’s clear that even before that moment, my 1963 trip to Italy at the age of nineteen (the same age Floriana was when she met Sandro) planted the first seeds. "Meticulously researched, you'll be transported to another time and place...and meet well-drawn characters. Dorah Blume has given us a masterpiece." "I manifested a cold so that I could crawl into bed for three days to finish the book." Musings from long ago . . .
• A boyfriend of my Bennington classmate Margo commented in 1963 that I resembled someone in a Botticelli painting. • When my Italian lover crossed the Atlantic in 1964 to spend a summer with me, we tracked down his distant relation who was living in Hyde Park, Boston. Zio recounted a World War II experience in Italy—seeing infant skeletons fall out of the walls of a bombed-out convent. • In his mid-sixteenth-century tome, Lives of the Artists, Vasari referred to Botticelli as a minor artist. Why? Added to that, I had heard the legend of Sandro burning his work on the Bonfire of the Vanities, set by the Dominican friar Savonarola. What would have possessed the artist to do such a thing? The first few lines of Botticelli’s Muse began as a free-write session in my living room. It took a full year for me to discover the voice belonged to a character in a Botticelli painting. A visit to Italy in the summer of 1993, and an unplanned sojourn in hotel Mona Lisa (a building that had lodged the religious heads from Constantinople and Rome for the Council of Florence in 1438) introduced me to the matron of the hotel, Oslavia, who inspired the character of Sandro’s sister. I searched the archives of Florence’s synagogue/temple library and the Jewish burial grounds, using my inadequate Italian to find names and places that might show me a way back in time. As my imagination expanded these historical scraps, a story began to unfold. Chris Keane’s novel workshop at Emerson helped me flesh out the characters, weaving actual historical events into an ambitious thirty-two-chapter outline that spanned 1477 to 1498. After graduate school, I set the project aside to collect its requisite pound of dust. Prompted by an essay written by Aram Saroyan titled “The Lake Matters: Notes about Writing and Life,” and sent to me by a fellow writer, Anne Gilman, I set aside the outline and resumed work on the manuscript on July 21, 2002, eschewing any editing. The goal: to find out what the story was about, and then to be its first reader. In fourteen months the book grew from 50 to 800 pages. And the time span of the first volume of the story, which became Botticelli’s Muse, shrank from twenty years to eighteen months. Michele Sdougas, a student of the Renaissance and owner of a vast library, loaned me books and also read the manuscript in subsequent drafts which pared the number of pages down and made way for the series that is now in progress. After I had formatted it for publication over a year ago, she suggested that I illustrate it. Within a few short weeks, my illustrations began to emerge. 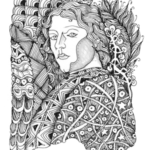 They combine the intricacy of a meditative style of abstract drawing introduced by Rick Roberts and Maria Thomas of zentangle.com with realistic forms of people, vegetation, and animals. I generated over 100 drawings for the book, which I credit to D. Bluestein. An Italophile since the age of nineteen when she studied painting at Academy of Fine Arts in Florence, Italy, Dorah Blume has published short fiction and nonfiction in newspapers, magazines, and literary journals and was nominated for a Pushcart Prize for “Hunger for Learning.” Considering herself a late bloomer, she expanded her artistic reach from visual to the written word in her forties with an MFA in creative writing from Emerson, and has navigated between the two ever since. 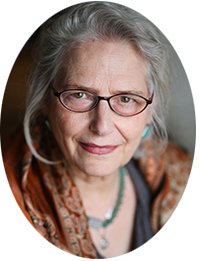 As a certified Amherst Writers & Artists (AWA) facilitator, Dorah has led Juiceboxartists writing workshops for adults in Greater Boston as well as in Tuscany, and will soon offer online writing workshops. She divides her time between Boston and Los Angeles with frequent trips to Italy. If she could possess one superpower, it would be to understand and speak every language on the planet. BOTTICELLI’S MUSE is sprinkled with black and white original drawings you won’t see anywhere else. Download your 5 free color-in pages today. You’ll get background information on the characters, and you’ll be part of my private inner circle for news, updates, and more free images from this historical novel, now for sale. 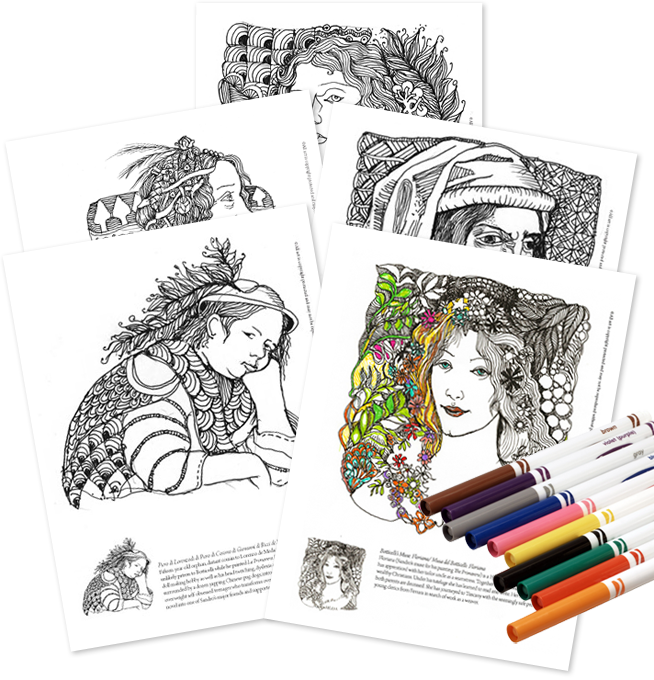 Download 5 coloring book pages!